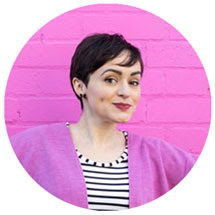 There's a little subtitle for this post which reads, “When your sewing pattern is designed for woven fabrics”. 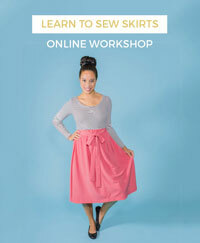 Since we listed ponte di roma or double knit alongside woven fabrics as a suggested material for sewing the Martha dress, we’ve had some questions about how to sew with it and any special considerations or changes you’d need to make. So today I thought it worth discussing tips on sewing ponte when the pattern you’re using is primarily designed for woven fabrics. 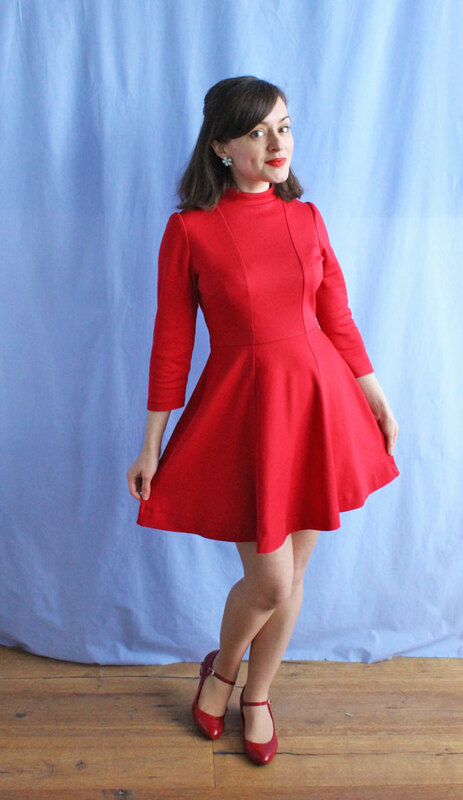 This is a ponte Martha dress that I made for myself – I absolutely loooove how it looks and feels in this fabric. It looks smart yet is soooo comfy to wear! And it’s great for twirling, as demonstrated in this little video I posted to Instagram. Ponte di roma is a type of double knit fabric – I’m calling it ponte as this type of fabric is relatively easy to find, in UK fabric shops at least (take a look at the links on the right and search “ponte” to see their selections). It’s medium weight, with very little stretch, and looks very similar on both sides. Compared to other knit fabrics, ponte is relatively stable and holds its shape nicely – which means it can work really well with some sewing patterns that are designed for woven fabrics – even if they don't list it in the fabric suggestions. Consider the properties of ponte versus how you want the garment to hang on your body. Firstly, the knit structure gives it a little bit of stretch, so it will mould to your body at the same time as being comfortable to wear. So it can work well on fitted bodices, skirts and wiggle dresses where a bit of stretch would allow you to sew a closer fit and still breathe, run for the bus and eat your lunch! Ponte also has a nice amount of body to it, so it holds a garment’s shape pretty well. It can work well for a panelled skirt, fit-and-flare dress as well as some jackets. Because of the body, I wouldn’t use it on a garment that you want to look light and drapey though, such as a blouse or blousey dress (like the Bettine dress, where you want a soft drape at the waist) – it could end up looking a bit bulky. When fitting your dress, bear in mind that the fabric has a bit of stretch to it - but not loads. What I usually do is cut out my usual size, so I know that the neckline and other details are where they’re supposed to be. Then I pin or tack the seams before sewing them together and try it on as I go - at this point I usually take in the seams to account for the stretch. When sewing, just follow the pin lines (rather than the seam allowance guide) to sew it the right size. Simples! Some design features look better than others in ponte, so consider which variation to make and whether to change certain details. Take the sleeves on the Martha dress, for example. The short fitted sleeves would look really cute it ponte. The bell sleeves, on the other hand, look a bit weird. Trust me, I've tried it! 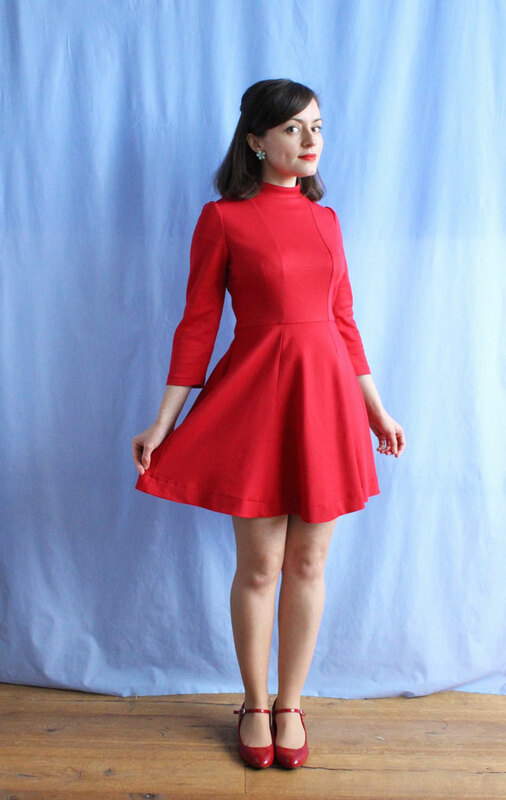 The sleeves on this dress started out as bell sleeves but, while they look lovely in a lightweight crepe de chine, they were a bit much in heavy fabric, so I took them in at the underarm seam to make them more fitted. I wouldn’t suggest you do the same, as the wide sleeve head of the bell sleeve has made the sleeves hang a bit funny. Instead, just go with the narrow short sleeves in the pattern and extend the underarm seams down if you want to make them longer. Change your sewing machine needle to a ballpoint for sewing ponte – the rounded end won’t snag the loop structure of the fabric. Lower the presser foot pressure (if your sewing machine lets you do this) so it doesn’t stretch out the fabric as it’s going through the machine. And ideally use a walking foot or dual feed foot, which will feed both layers of fabric through at the same speed so you don’t get rippled seams. Stretchy knit fabric usually needs to be sewn with a zigzag stitch or overlocker (serger) so the stitching doesn’t snap as the seams stretch. But if you’re sewing a dress designed for woven fabrics – and therefore which doesn’t need to stretch to get it on and off, because it has a zip or other opening – you’ll probably be fine sewing it with a straight stitch. Do test your stitching out on a double scrap of your dress fabric first, and if you do think the seam needs to stretch you can always sew with a narrow zigzag. 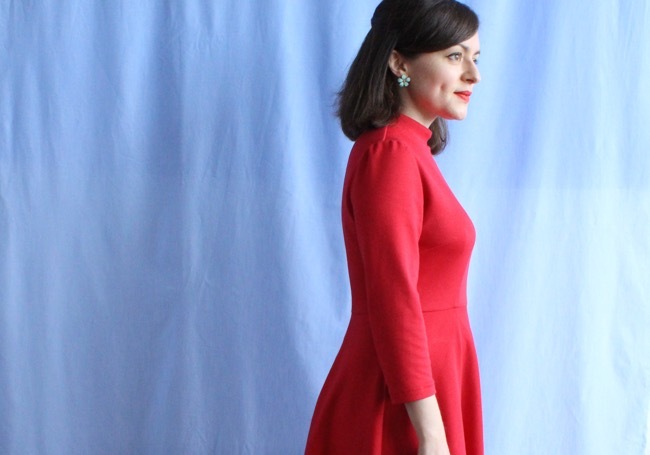 If you’re a regular reader, you may remember I made a jersey Bettine dress – which is designed for woven fabrics – last Summer (can’t wait for the weather to warm up so I can wear it again!). For that dress, I replaced the neckline facing with a neckband so that it would pull the fabric in and stop it gaping. Someone asked on Instagram if they need to do the same thing when sewing Martha in ponte. You don’t! Simply sew the neckline facing as normal. You can interface the neckline facing too. You can get knit interfacing, although it’s a little hard to come by, and I’ve always found woven interfacing works fine with double knits when you don't need to stretch the garment to get it on and off. 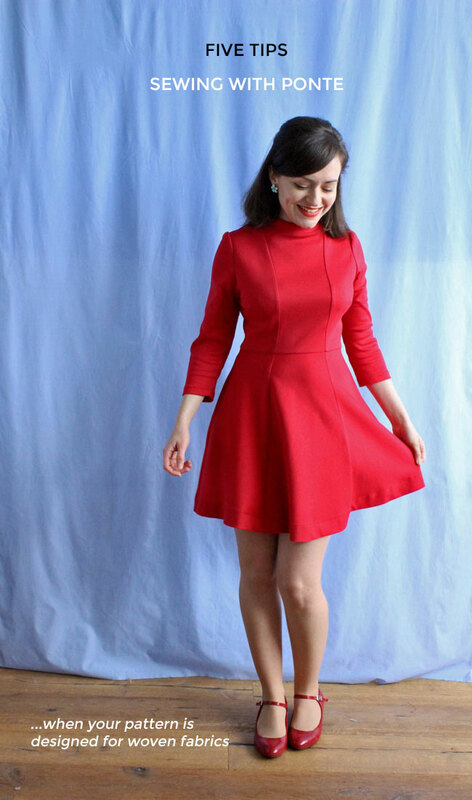 If you make the Martha dress, don’t forget to share your pics – we’d love to see! Tag us on Instagram @TillyButtons #SewingMartha. And remember we’re holding an Instaspam party on Saturday 7 May. Hope to see you there! Saturday Sew In at John Lewis!